Education Pioneers’ nearly 4,000 leaders work to give students the opportunity to reach their full potential and build prosperous lives. 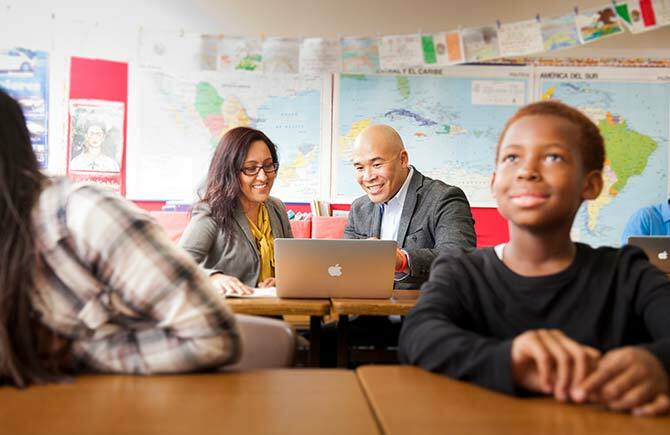 EP is one of the only organizations that brings thousands of extraordinary people from diverse backgrounds into education leadership roles nationwide. Over the last 15 years, we've partnered with 750+ education organizations in cities across the country to connect them with the talented people they need to drive mission-critical work for students—nearly 4,000 Pioneers to date and counting. All data on our Pioneers is from internal surveys and analyses. Our Pioneers are courageous change makers. In education’s complex environment, they seek out and act on opportunities to drive real impact for the students who need it the most. At EP, we know what to look for when we vet talent, and we put our Pioneers on the fast-track to becoming powerful education leaders. These “Masters of Complexity” have the skills and mindsets needed to ensure that all education organizations not only succeed, but flourish. More than 50% of EP Alumni self-identify as leaders of color or multiethnic. More than 70% of EP Alumni in the workforce are working in education, in increasingly high-leverage roles. Alumni who work in education stay in education: 94% of EP Alumni who worked in education in 2012 were still there in 2016. It's an honor and a privilege to do this work and more than I hoped it could be. I am extremely grateful to Education Pioneers for supporting me from the beginning. Nationwide, our Pioneers lead cutting-edge work across the education sector. Their impact is felt across departments and functions for school districts, charter school organizations, education nonprofits, and more. Together, and in collaboration with our Partner organizations, our Pioneers are working hard to support students, teachers, schools, and communities for success. Our Pioneers ensure that education organizations have the capacity and expertise to track, analyze, and use data meaningfully. Short-term Impact: 95% of analyst Pioneer supervisors agree or strongly agree that their Pioneer has improved the efficiency and/or effectiveness of their department or team in the short term. Long-term Impact: 95% of analyst Pioneer supervisors agree or strongly agree that their Pioneer has improved the efficiency and/or effectiveness of their department or team in the long term. Data-Driven Decisions: 92% of analyst Pioneers supervisors agree of strongly agree that their team or department is better positioned to make data-driven decisions as a result of their Pioneer. Many of our Pioneers have deep education expertise. Through EP, they’ve helped shape policy for the U.S. Department of Education; supported the development and roll-out of new curriculum for Boston Public Schools; updated Year Up’s technology curriculum model; and much more. Plus, over 200 of our Pioneers have founded (or are launching) their own education organizations in a variety of subsectors, including edtech, nonprofits, schools, and food service. Some of the accolades they've received include being named to Forbes’ 30 under 30 list, recognized as founders of Fast Company’s most innovative companies in the world and in education, and named as finalists for visionary awards and multi-million dollar prizes. Most importantly, together our Pioneers are reimagining public education for every student in our country. Our Pioneers help education organizations balance budgets, reduce expenses, identify savings, and lead capital planning to drive as many dollars as possible to schools and classrooms while building sustainable institutions. Our Pioneers have conducted a cost-benefit analysis of potential software solutions for schools to improve instruction for Victory Education Partners in New York; have optimized central office processes for the Achievement School District in Tennessee to ensure schools have the financial resources they need; and have managed a $21 million budget for KIPP in Texas. The caliber and demonstrated quality of our Pioneers’ work is absolutely unquestioned. I’ve been able to bring in people with skills targeted to a specific outcome and move big bodies of work forward. In education, recruiting, retaining, growing, and supporting exceptional people is vital to students’ success. Education is a $600 billion industry that employs 13 million people and our nation’s second largest workforce—teachers. There are tremendous opportunities to grow and support the teachers and staff who work across the education sector. attract, develop, support, and evaluate effective teachers. attract, develop, support, and evaluate effective school leaders. integrate blended learning into classrooms to ensure that students are learning 21st century skills. Education organizations rely on efficient, effective operations – like facilities, transportation, food service, and more – to ensure that students, teachers, and principals are supported to make magic in the classroom. Our Pioneers have ensured that in Boston, public school students get to school safely and on time; that in New York, principals spend less time on administrative tasks and more time on instructional leadership for the city’s teachers and 1.2 million students; that in Los Angeles, the country’s second largest school district has the infrastructure it needs to serve nearly 700,000 students; and that over 12,000 students on the East Coast have access to healthy school meals that help them learn and thrive in school. In education’s complex environment, sound strategy matters tremendously. Our Pioneers bring deep strategic expertise to lead growth and expansion, community engagement, marketing, human capital, technology, and much more. Our Pioneers have helped NewSchools Venture Fund identify the best opportunities for investment in early childhood education and education technology; have analyzed and made recommendations to retain more teachers in the San Francisco Unified School District, as well as crafted an early education strategy to improve and expand services while also reducing costs; and have helped Newark Public Schools implement talent management technology and develop a student engagement strategy. United we stand, together we go far. Our Pioneers hail from diverse personal and professional backgrounds, but what unites us is the importance of fighting for a cause that’s larger than ourselves.